Most of the future increase in livestock production is expected to occur in the tropical and subtropical regions of the world. Cattle are the most numerous of the ruminant species in the tropics and provide the largest quantity of animal food products. More than one-third of the world's cattle are found in the tropics. 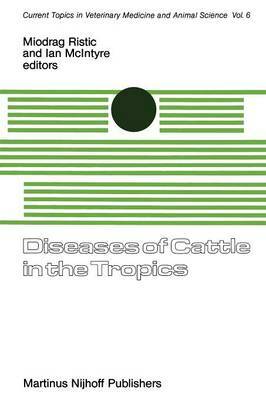 Disease is the major factor which prohibits full utilization of these regions for cattle production. Various infectious and transmissible viral, rick- ettsial, bacterial, and particularly protozoan and helminthic diseases, are widespread in the tropics and exert a heavy toll on the existing cattle industry there. This uncontrolled disease situation also discourages investment in cattle industries by private and government sectors. In Africa alone, it is estimated that 125 million head of cattle could be accommodated in the tropical rainbelt if the disease and other animal husbandry factors could be resolved. The potential of efficient cattle production under more favorable conditions prompted various international agencies to establish a multi- million dollar International Laboratory for Research in Animal Diseases (ILRAD) in Nairobi, Kenya, Africa. In South America, principal sites for raising cattle are shifting to the savannah lands because the more fertile soils are being used for crop produc- tion, however, in the savannahs also, disease remains the most powerful deterrent in implementing the cattle industry.